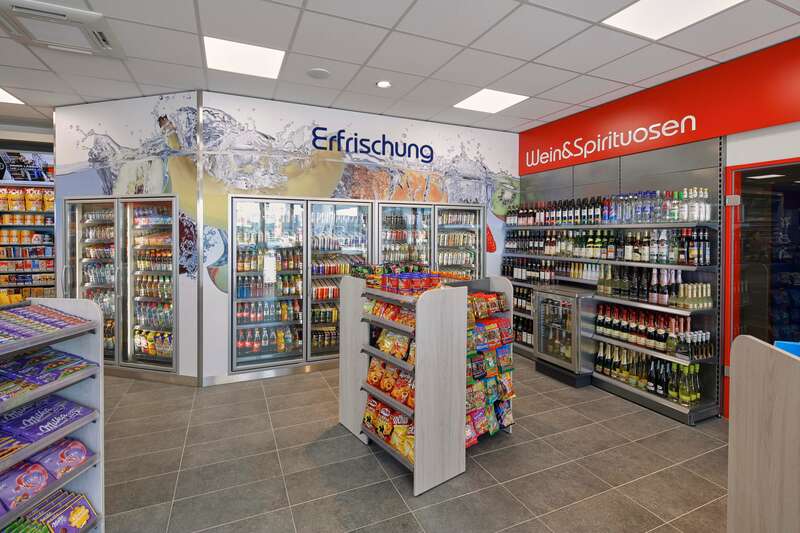 thiem is a service provider specialising in shop fittings for petrol stations, car dealerships, retail shops and tobacconists at a national and an international level. We are a medium-sized, owner managed company committed to supporting your success through maximum flexibility, diversity and sensitivity. We have been developing ideas for shop fitting systems for 40 years now, and our customer base ranges from retailers and medium-sized enterprises to market leaders in the mineral oil and tobacco industries. In order to provide you with suitable shop solutions on a reliable and uncomplicated basis, we have specialised in tailored shop fittings of all sizes. With our know-how gained over the past decades, we have become one of Hamburg's top addresses in the field of shop fitters. As a SCC**-certified company, we fulfil the particular standards required for our activities in the area of petrol station fittings. We would be happy to discuss individual solutions that we can develop and implement for you. Please contact us – we look forward to meeting you! With creative minds and a visionary approach, we lay the foundation for successful solutions. This is always in close coordination with you, taking the product-specific requirements into consideration. We create solutions according to your expectations, to suit your budget and your premises. The idea is visualised with the aid of state-of-the-art technology in our in-house design department. This visualisation gives your shop fittings a face. As logistics professionals, we have comprehensive experience in storage, order picking and dispatch on all scales. Our field staff throughout the country as well as partners in Germany and abroad ensure flexibility and short distances. Full service is an integral part of our corporate philosophy. thiem provides you with everything from a single source − from the floor plan down to the last screw. We accompany and advise you and remain as partners at your side after the contract has been awarded. Whether you are looking for a single module, partial modernisation or complete fittings from the floor up to the ceiling with integrated lighting − we look forward to your visit! Your business requires a professional solution. We and our entire team are at your service to achieve this goal for you. Your customers want a shopping experience in a pleasant atmosphere, which we would be glad to create for you. Once you have contacted us, you send us the floor plan of your premises as a basis for planning or we arrange an appointment to record your requirements on-site. On this basis, we prepare a planning proposal with visualisations for further coordination with you, either in our offices or at your premises. We then prepare an offer based on the coordinated planning. Once you have placed your order, you either receive details of the installation requirements for the performance to be provided by you or we take care of everything as a general contractor. Delivery and assembly are carried out by our experienced installation teams. We have developed suitable solutions for tidy and clean presentation on the areas in front of your sales space. The tried and tested outside cart system: versatile, inexpensive and strong in sales. Our policy is to ensure that you are satisfied with the results, and we do everything we can to achieve this. We would like to gain you as a new reference customer and impress you with our performance!